Friedreich's ataxia (FA) was first described by Nikolaus Friedreich in 1863. FA is a neurodegenerative disease and is one of the most common autosomal recessive ataxia diseases worldwide . People with gene mutations associated with FA have no symptoms at birth and for a period of time after birth, until onset during adolescence (mean 15.5 years). FA is caused by expanded guanine-adenine-adenine (GAA) triplet repeats in the frataxin gene. This results in reduction of messenger RNA and protein levels of frataxin in different tissues throughout the body . Frataxin deficiencies in FA affect the nervous, cardiovascular, endocrine, and musculoskeletal systems. The disease is often associated with complex clinical and pathological changes and slowly progresses over time. Dorsal root ganglia: FA results in lesions of the dorsal root ganglion (DRG). The DRG is a cluster of nerve cell bodies in the dorsal root of a spinal nerve that contains the cell bodies of afferent sensory neurons. Dentate nuclei: FA also causes metabolic disturbances that lead to dentate nucleus atrophy. The dentate nuclei are the largest of the deep cerebellar nuclei, located within each cerebellar hemisphere. These nuclei are crucial structures that link the cerebellum to other areas of the brain. Spinal cord: FA results in a reduction of spinal cord diameter at all levels . Within the thoracic level, thinning is more obvious and often includes lesions of the gracile and cuneate fasciculi. The gracile fasciculi are bundles of axon fibers involved in the posterior column-medial lemniscus pathway, carrying afferent sensory information from the middle thoracic and lower limbs. The cuneate fasciculi transmit sensory information from the upper limbs. Additionally, FA also leads to fibre loss in the spinocerebellar and corticospinal tracts. The spinocerebellar tract carries proprioception and cutaneous information to the cerebellum for coordination of movement. The corticospinal tract originates from the cerebral cortex and controls motor function in lower and upper limbs. FA is an autosomal-recessively inherited disorder, meaning that both biological parents must carry the trait. 95% of people diagnosed with the disorder are homozygous for unstable guanine-adenine-adenine expansion in the first interon of the frataxin gene on chromosome 9q21. The other 5% of people diagnosed are compound heterozygotes with an expansion on one allele and conventional mutations on the other. In both cases, the mutation interferes with the transcription of frataxin gene, and results in a frataxin deficiency. Frataxin is a protein associated with the inner mitochondrial membrane, which is essential for normal cell functioning. Mitochondrial function is critical for processes such as energy metabolism, maintenance of the membrane potential, calcium metabolism, correct protein folding, axonal transport and synaptic transmitter homeostasis. Within the mitochondrial membrane, frataxin is used to move iron and form iron-sulfur clusters. Inadequate frataxin results in iron accumulation, which leads to degenerative changes in the spinal cord, dorsal root ganglia and cardiovascular system. The dorsal root ganglia are the first structures to experience degenerative changes. Throughout the degenerative disease process, axonopathy begins to impact structures such as the dorsal columns, cuneate and gracile nuclei, dorsal nuclei of Clarke, spinocerebellar and corticospinal tracts . The cerebellum is also affected, with lesions occurring to the dentate nuclei and superior cerebellar peduncles. As previously mentioned, spinal cord diameter decreases over time, especially in the thoracic region. Eventually, patients with FA will develop hypertrophic cardiomyopathy as the mitochondrial changes lead to fibrosis, inflammation, scarring and accumulation of iron in the left ventricle of the heart. FA is the most common inherited ataxia. Due to a unique gene mutation, the disease rarely occurs in non-caucasians . Approximately 1 in 50 000 caucasians are affected. The point prevalence is estimated to be as high as 3/100,000. FA is a disease that affects young individuals, as the onset of symptoms typically occurs before the age of 20. In a large FA clinical study (n=115), a fifth of patients were under 5 years old at disease onset. FA appears to affect males and females equally . FA is a progressive neurodegenerative disease. Therefore, the severity of symptoms will vary depending on the disease stage. The hallmark clinical feature is ataxia, likely due to degenerative atrophy of the posterior columns of the spinal cord and loss of peripheral sensory nerve fibres. To a lesser extent, cerebellar atrophy occurs and contributes to ataxia. Ataxia is characterized as lack of muscle control and reduced coordination of voluntary movements. Many of the cardinal symptoms associated with FA can be seen in this video. FA is an early onset, slowly progressing neurodegenerative disorder. Early signs of FA include an unsteadiness of gait, general “clumsiness”, and scoliosis . Disease progression and onset of clinical features can be variable. Ataxia (truncal and limb), lower extremity weakness, and sensory loss is progressive and gradually extends from distal to proximal. Typically, patients become wheelchair bound between 11-15 years after disease onset  due to lower extremity muscle weakness, truncal ataxia, and limb ataxia. Dysarthria becomes apparent at 2 years of disease onset and slowly progresses. Additionally, approximately 10% of individuals with FA develop diabetes, further complicating their disease status. Cardiac involvement, specifically cardiomyopathy, combined with disease onset before age 20 is associated with a faster disease progression. The most common cause of death is cardiomyopathy. Life expectancy is decreased and death occurs at an average age of 37.5 +/- 14.4 years. There is currently no cure for FA. The gold standard for diagnosing FA is molecular testing. The disease is truly confirmed by testing for expansions or mutations in the FXN (frataxin) gene. However, the following clinical diagnostic criteria may be used to assist in the diagnosis of FA. The first set of diagnostic criteria most commonly used was developed in 1976 by the Quebec Cooperative study of Friedreich’s Ataxia (QCSFA). Although the gold standard for diagnosing FA is genetic testing, these criteria can still be used in clinic for highly probable diagnosis and eligibility for referral and/or genetic screening. The accuracy of these clinical diagnostic criteria were examined and the sensitivity for both yielded 63%, the specificity for the QCSFA was 98% and 96% for the Harding Criteria. The following outcome measures can be used to assess the progression and/or regression of conditions associated with FA. Please note that this is not an exclusive list of the only appropriate outcome measures nor are they necessarily the best depending on the unique symptoms of the patient. International Cooperative Ataxia Rating Scale (ICARS): developed to determine the level of impairment from ataxia related to genetics. Scale for the Assessment and Rating of Ataxia (SARA): similar scale to the ICARS to assess ataxia but shorter to administer. Friedreich’s Ataxia Rating Scale (FARA): assessment for ataxia specific to FA. 6 Minute Walk Test: assesses aerobic capacity and gait. Timed Up and Go (TUG): assesses fall risk, balance and gait. Goal Attainment Scale: individualized outcome measure to assess the extent the patient meets their various goals. Berg Balance Scale: useful in early stages when individual is not yet using a wheelchair. Pediatric Balance Scale: used to assess balance in everyday tasks of adolescents specifically. Functional Independence Measure: measure of physical, psychological and social function. Child Occupational Self-Assessment (v 2.2): a self-report measure for how competent children and adolescents feel completing every day activities and how much value they place on these activities, ages 6-17. Depression Anxiety Stress Scale: can be used in later stages of the disease to assess potential symptoms of depression, anxiety and stress. Management of Freidreich’s ataxia follows a symptom-management approach, delivered by an interdisciplinary team. Clinical management guidelines suggest that physical therapy may be beneficial in treating the neurological components of FA. Physical therapy has been shown to improve or maintain balance, flexibility, strength, and accuracy of limb movements in patients with FA. An appropriate exercise program may also be effective in prolonging independent ambulation and reducing falls in this population. Furthermore, the effects of a physiotherapy intervention for patients with FA have been shown to continue after completion of the program, suggesting more than only short-term benefits. Additional research is required to determine the intensity, type, and length of rehabilitation program necessary to achieve positive results in this specific population. Until there is a greater body of evidence to guide physical therapy interventions for FA, physical therapists may refer to the literature for the treatment of cerebellar ataxias in general. The most frequently reported interventions for these disorders include proprioceptive neurofacilitation, balance retraining, and Frenkel exercises to encourage control of voluntary movements. Benefits of physical therapy interventions for cerebellar ataxias include improvements in gait and trunk control and a decrease in activity limitations. In addition, aerobic exercise may help to decrease weakness and fatigue in those with degenerative cerebellar ataxias. These benefits could be important in patients with FA exhibiting cardinal symptoms such as unsteadiness and gait abnormalities. The foot deformities associated with FA can exacerbate gait abnormalities and unsteadiness. It is suggested that deformities be prevented through early provision of physiotherapy, splinting, and botulinum toxin injection. When conservative methods are ineffective in managing foot deformities, more aggressive surgical interventions are warranted. See Physiopedia page Scoliosis: Physical Therapy Management. Speech and swallowing difficulties are common in patients with FA. It is recommended that patients seek speech language therapy to improve speech generation, learn alternative modes of communication, and receive therapy to facilitate swallowing. Cardiomyopathy associated with FA may be managed medically through antioxidant administration, idebenone treatment (with inconsistent results), and conventional methods such as heart failure drugs, antiarrythmic drugs, and device implantations. The symptoms associated with FA are often similar to other early onset, progressive ataxias. However, it is the unique cardinal symptoms of FA that differentiate this disorder. In some cases, FA can be differentiated from other progressive cerebellar ataxias by testing for absence of lower limb reflexes. Other symptoms such as cardiomyopathy, optic atrophy and severe scoliosis may also be specific indications of FA. Despite the unique cardinal signs of FA, making a differential diagnosis can still be challenging in some cases. For example, sensory ataxia and absent deep tendon reflexes are also present in the Roussy-Levy variant of Charcot-Marie Tooth disease. Specific nerve conduction tests are required to differentiate between these conditions. Another specific disorder that may present similarly to FA is AVED (ataxia with isolated vitamin E deficiency), an autosomal disorder that results in progressive spinocerebellar symtoms. Clinical indicators such as gait and limb ataxia, dysarthria, areflexia, sensory loss, and foot deformitites may appear very similar to FA. However, the neuropathic symptoms in AVED are central and often paired with titubations, which are characteristics rarely seen in classical FA. Due to the many similarities between FA and other ataxias, molecular testing methods should be used to achieve an accurate diagnosis. Click here for more information and resources regarding FA. Click here to learn more about current research aimed at finding a cure for FA. ↑ 1.00 1.01 1.02 1.03 1.04 1.05 1.06 1.07 1.08 1.09 1.10 1.11 1.12 1.13 1.14 1.15 1.16 1.17 Burk K. Friedreich ataxia: current status and future prospects. Cerebellum & Ataxias. 2017;4:4. ↑ 2.00 2.01 2.02 2.03 2.04 2.05 2.06 2.07 2.08 2.09 2.10 2.11 2.12 2.13 2.14 2.15 2.16 Koeppen, A. Friedreich’s ataxia: pathology, pathogenesis, and molecular genetics. J Neuro. Sci. 2011;303;1-12. ↑ 3.0 3.1 3.2 3.3 3.4 3.5 3.6 3.7 3.8 3.9 Abrahão A, Pedroso JL, Braga-Neto P, Bor-Seng-Shu E, de Carvalho Aguiar P, Barsottini OG. Milestones in Friedreich ataxia: more than a century and still learning. Neurogenetics. 2015;16(3):151-60. ↑ 4.0 4.1 Friedreich Ataxia Research Alliance. [/www.curefa.org/whatis http://www.curefa.org/whatis] (accessed 4 May 2018). ↑ Harding E. The hereditary ataxias and related disorders. Edinburgh: Churchill Livingstone, 1984. ↑ 6.0 6.1 6.2 6.3 6.4 6.5 6.6 6.7 6.8 Pandolfo M. Friedreich ataxia: the clinical picture. J Neurol. 2009;256:3-8. ↑ Harding E, Zilkha J. Pseudo-dominant inheritance in friedreich’s ataxia. J Med Genet. 1981;18:285-7. ↑ 8.0 8.1 8.2 8.3 8.4 8.5 8.6 Delatycki M, Williamson R, Forrest S. Friedreich ataxia: an overview. J Med Genet. 2000;37:1-8. ↑ 9.0 9.1 Harding E. Friedreich’s ataxia: a clinical and genetic study of 90 families with an analysis of early diagnostic criteria and intrafamilial clustering of clinical features. Brain. 1981;104(3):589–620. ↑ 10.0 10.1 10.2 10.3 10.4 Filla A, De Michele G, Coppola G, Federico A, Vita G, Toscano A, Uncini A, Pisanelli P, Barone P, Scarano V, Perretti A, Santoro L, Monticelli A, Cavalcanti F, Caruso G, Cocozza S. Accuracy of clinical diagnostic criteria for friedreich’s ataxia. Mov Disord 2000;15(6);1255-8. ↑ Oglesbee D, Kroll C, Gakh O, Deutsch E,Lynch D, Gavrilova R, Tortorelli S, Raymond K, Rinaldo P, Matern D, and Isaya G. High-throughput immunoassay for the biochemical diagnosis of friedreich ataxia in dried blood spots and whole blood. Clin Chem 2013;59(10);1461-9. ↑ 12.0 12.1 12.2 Geoffroy G, Barbeau A, Breton G, Lemieux B, Aube M, Leger C and Bouchard JP. Clinical description and roentgenologic evaluation of patients with friedreich's ataxia. Can J Neurol Sci 1976;3(4);279-86. ↑ 13.0 13.1 13.2 Cook A, Giunti P. Friedreich’s ataxia: clinical features, pathogenesis, and management. Br Med Bull 2017;124(1)19-30. ↑ 14.0 14.1 Corben LA, Lynch D, Pandolfo M, Schulz JB, Delatycki MB. 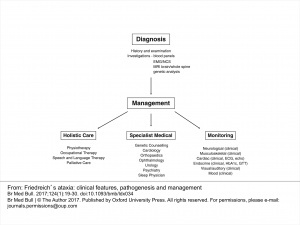 Consensus clinical management guidelines for Friedreich ataxia. Orphanet J Rare Dis 2014;9(1):184. ↑ Milne SC, Campagna EJ, Corben LA, Delatycki MB, Teo K, Churchyard AJ, Haines TP. Retrospective study of the effects of inpatient rehabilitation on improving and maintaining functional independence in people with Friedreich ataxia. Arch Phys Med Rehab 2012;93(10):1860-3. ↑ 16.0 16.1 Martin CL, Tan D, Bragge P, Bialocerkowski A. Effectiveness of physiotherapy for adults with cerebellar dysfunction: a systematic review. Clin Rehabil 2009;23(1):15-26. ↑ Ilg W, Synofzik M, Brötz D, Burkard S, Giese MA, Schöls L. Intensive coordinative training improves motor performance in degenerative cerebellar disease. Neurology 2009;73(22):1823-30. ↑ Delatycki MB, Holian A, Corben L, Rawicki HB, Blackburn C, Hoare B, Toy M, Churchyard A. Surgery for equinovarus deformity in Friedreich’s ataxia improves mobility and independence. Clin Orthop Relat Res 2005;430:138-41. ↑ Jensen MK, Hundgaard H. Cardiomyopathy in Friedreich ataxia. Circulation 2012;125:1591-93. ↑ 20.0 20.1 Harding AE. Early onset cerebellar ataxia with retained tendon reflexes: a clinical and genetic study of a disorder distinct from Friedreich's ataxia. J Neurol Neurosurg Psychiatry 1981;44(6):503-8. ↑ 21.0 21.1 Wood NW. Diagnosing Friedreich’s ataxia. Arch Dis Child. 1998;78(3):204-7. ↑ Mariotti C, Gellera C, Rimoldi M, Mineri R, Uziel G, Zorzi G, Pareyson D, Piccolo G, Gambi D, Piacentini S, Squitieri F. Ataxia with isolated vitamin E deficiency: neurological phenotype, clinical follow-up and novel mutations in TTPA gene in Italian families. Neurol Sci 2004;25(3):130-7.